Finally, a therapeutic dose of the three most researched and affordable joint nutrients on the market. No fillers, sugars or grain to throw feed rations off balance. Made to work and priced to keep. 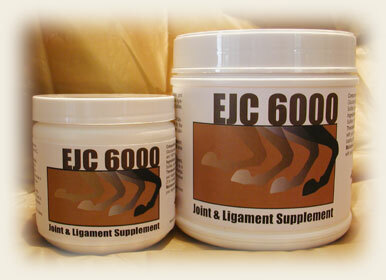 Each 6000mg serving provides 4000mgs of Glucosamine HCL, 1000mgs Chondroitin Sulfate, and 1000mgs of MSM. EJC6000 provides 151 servings or a 5 month supply at maintenance dosage. Your cost is less than $20.00 per month! All ingredients are 100% pure Pharmaceutical grade and non-toxic. Custom formulated for all ages and classes of horses. EJC6000 908 grams (large) – One scoop contains 4,000 mgs of Glucosamine HCL, 1,000 mgs of Chondroitin Sulfate, 1,000 mgs of MSM. Feed 3 scoops per day for the loading phase of 3 – 4 weeks. When symptoms disappear, lower dose to 1 scoop per day. There are 908 grams of EJC6000 per container. There are 151 servings at maintenance dose of 1 scoop (6,000 mgs) per day. EJC6000 360 grams (small) – One scoop contains 4,000 mgs of Glucosamine HCL, 1,000 mgs of Chondroitin Sulfate, 1,000 mgs of MSM. Feed 3 scoops per day for the loading phase of 3 – 4 weeks. When symptoms disappear, lower dose to 1 scoop per day. There are 360 grams of EJC6000 per container. There are 60 servings at maintenance dose of 1 scoop (6,000 mgs) per day. 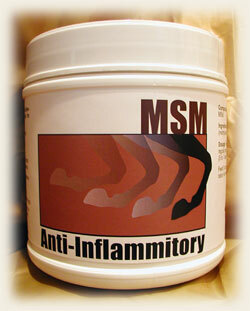 When pain management is the only reasonable outcome, use MSM to help your horse be more comfortable. Meant for long-term use and completely non-toxic. This is a new factory sealed 600g container of 100% pure MSM (Methysulfonymenthne). This is a 60 day supply, just use as a top dressing on sweet feed. Each serving provides 10,000 mgs of 100% pharmaceutical grade MSM. Compare this product with all other Equine MSM products and you will see that nothing comes close for the money. Two scoops contain 10,000 mgs. of 99.9% pure MSM (Methysulfonymenthne). Therapeutic dose is 4 scoops (20,000) per day. Maintenance dose is 2 scoops (10,000) per day. There are 600 grams in each container, 60 servings at maintenance dose. Probiotics – reduces acid, may prevent founder, improves immunities, mare’s milk becomes more rich, promotes bone health and normal growth. 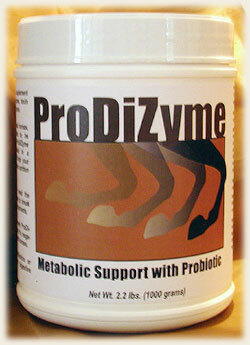 Enzymes – colic prevention, metabolically releases vitamins from feed rations, digestion of fiber. Trace minerals – many metabolic functions, hoof growth, coat condition, bright eyes, reproduction, and fertility. Toxin Binders – removes bad bacteria from hind gut. Serving size equals one heaping scoop or one ounce of product. There are 30 servings per container. Horses in poor condition may require 2 scoops per day. Ingredients: Yeast Culture, Dried Saccharomyces cerevisiae fermentation solubles, brewers yeast, Yucca Shidigera, Ginger, Calcium Carbonate, Zinc Polysaccharide Complex, Copper Polysaccharide Complex, Manganese Sulfate, Ferous Sulfate, Zince Sulfate, Colbalt Polysaccharide Complex, Copper Sulfate, Colbalt Sulfate, dl-Alpha Tocopheryl Acetate, Dried Aspergillus Orzaye, enterococcus faecium, lactobacillus acidolphilus, lactobacillus casei, Choline chloride, Calcium iodate and Niacin. TOTAL BACTERIA PER SERVING – 3 billion cfu’s live, naturally occuring bacteria. ENZYMES PER SERVING – Aspergillus Orzae (min) Amylolytic activity (on starch): 4,250 modified Wohlgemuth, 1142 SKB. Cellulase Activity 9on cellulose): 1.42 Cellulase. Protease activity (on protein); 28 hemoglobin. 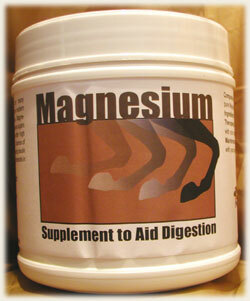 Magnesium Oxide – A trace mineral used in many metabolic functions. Primarily used for cresty and laminitic horses who exhibit signs of insulin resistance. One scoop contains 4,000 mgs of pure Magnesium Oxide. Therapeutic dose is 2 scoops (8,000) per day. Maintenance dose is 1 (4,000) scoop per day. There are 360 grams in each container, 90 servings at maintenance dose.